The following are court results for the Eastbourne area at Hastings Magistrates’ Court from July 6 - July 12. Marley Ward, 31, of Pevensey Road, Eastbourne, pleaded guilty to assaulting a woman by beating her. The offence took place at Polegate on June 21. He also pleaded guilty to assaulting a police officer at Polegate on the same date. He was sentenced to 16 weeks in prison, suspended for two years. The court also made a community order with a requirement to attend a domestic abuse programme. Magistrates said the reason for the sentence was that it was a ‘revenge attack’, which included flicking blood at the victim and spitting at them as well as spitting at the police officer. Alan Tusinski, 22, of Seaside Road, Eastbourne, was found guilty of driving a Honda vehicle on Langney Road, Eastbourne, on August 9 last year, with no insurance or licence. He was fined £180 and ordered to pay £670 in prosecution costs. He was also banned from driving for one year, as obligatory, due to repeat offending. Wilhelm Cain, 61, of Burwash Close, Eastbourne, was found guilty of assaulting a police officer. The offence took place at Eastbourne on September 23 last year. The court made a community order and ordered him to pay £200 in prosecution costs. Alex Aquino, 43, of Hoad Road, Eastbourne, pleaded guilty to driving a Dodge Nitro vehicle on the A27 Lewes Road, at Polegate on June 26, while over the drink-drive limit. He gave a breath alcohol reading of 59 micrograms in 100ml of breath. The legal limit is 35 micrograms. He was fined £340 and banned from driving for 16 months. Raymond Cosham, 50, of Bayham Road, Hailsham, pleaded guilty to six charges of being in possession of indecent images and movies at his Hailsham flat between May 31 2016 and March 25 2017. He was committed to Lewes Crown Court for sentencing on August 3 and released on conditional bail with the condition that he does not have contact with children under 18 and not to possess or use a computer or any device capable of accessing the internet. Bogdan Niwa, 51, of Susans Road, Eastbourne, pleaded guilty to failing to provide a specimen of breath for analysis when required to do so under the Road Traffic Act 1988. The offence took place at Eastbourne on June 12. He was fined £350 and banned from driving for two years. Louie Platt, 23, of Mill View Close, Westham, Pevensey, pleaded guilty to driving a Ford vehicle on Adur Drive, Pevensey, on April 23, with the controlled drug benzolecgonine in his bloodstream. He was fined £300 and banned from driving for one year. James Upton, 35, of Coast Road, Pevensey Bay, pleaded to driving a vehicle on West Parade, Bexhill, on May 11, with cannabis in his bloodstream. He was fined £300 and banned from driving for one year. Steven Fincham, 49, of Fairfax Road, Bridgwater, Somerset, pleaded guilty to driving a Mercedes vehicle on Railway Approach, Newhaven, on May 12, while more than three times over the drink- drive limit. He gave a breath alcohol reading of 118 micrograms in 100ml of breath. The legal limit is 35 micrograms. The court made a community order, with 100 hours of unpaid work and banned him from driving for 28 months. Angelo Kyprianou, 31, of Elms Avenue, Eastbourne, pleaded guilty to stealing footwear, of an unknown value, from T K Maxx, at the Crumbles, Eastbourne, on May 29. He also pleaded guilty to being in possession of an offensive weapon (a knuckle duster) in a public place, at Belmont Road, Eastbourne, on June 11. 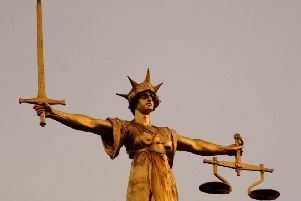 He pleaded guilty to stealing clothing from T Reds, at Terminus Road, Eastbourne, on June 8 and to stealing alcohol, worth £93.07, from C0-op in Seaside Road, Eastbourne, on May 21, He was committed to Lewes Crown Court for sentencing on August 9 and granted unconditional bail.